We have adopted the transliteration system of the International Journal of Middle East Studies (New York: Cambridge University Press). Translation and transliteration of Arabic and Turkish terms is provided in the Glossary, which is not indexed here. References to specific court and majālis cases, listed in the Table of cases, is not provided here. The index is mostly organized along thematic entries, many of which were crucial in the overall organization of the book. as Íanbalī judge in Damascus, 147f. ajr al-mithl, 175, 231, 261, 269f. historical knowledge of, 182, 203f. kadak (gedik), 227, 232f., 236f., 247, 273f. khulū, 55, 228, 230f., 236f., 247, 273f. māl mutaqawwam, 206f., 212, 217, 221, 249, 403, 586, 591, 620, 628f. mashadd maskeh, 227-228, 230, 248f., 271, 567f. body and value of organs, 619f. content of typical crime case, 638f. crime litigation as procedural fiction, 639f. next of kin, 618, 632, 662f. premeditated versus deliberate killings, 626f. regional councils (public jurisdiction of), 670f. tool-of-killing as corpus delicti, 615f., 621f. Damascus regional councils (1844-45), 525f., 670f. and performative role of discourse, 3, 328, 506f. of pre-modern societies, 7-8, 61f. in Ḥanafī general rules, 24f. in relation to regional councils, 564f. Íarfūshs of Ba‘albak (Emirs), 525f. fiction of state ownership of lands, 287f. kharāj and ‘ushr, 284f., 302f. premeditated versus deliberate killing, 627f. on custom, 27, 55-56, 71f. revocability or irrevocability of waqfs, 485f. and Ḥanafī judges, 15, 136f. dismissal in Ḥanafī literature, 296f. and the regional councils, 15, 525f. discourse on, 271, 280, 284f. and customary practices, 58, 85f. performative utterances, 87, 328, 477f., 506f. use of language, 477, 505f. Ḥanafī general rules (first 99 articles), 22f., 94f. economic analysis of, 5-6, 195f., 199f. premeditated versus deliberate killings, 627f. legal duration of a lawsuit, 116f. and regional councils, 554, 564f. Emir Bashīr II, 321f., 339f. estate of Bashīr II, 339f. sons of Bashīr II, 352f. language of judges, 477f., 506f. and performative role of discourse, 3, 477f., 506f. of the Ḥanafī fiqh, 48f. ﬁarābulsī, Burhān al-Dīn Ibrāhīm al-, 494f. linguistic component of, 45, 56, 70, 72, 85f. Emir Bashīr III Shihāb (waqf of), 402f. GHAZZAL, Zouhair. Index In : The grammars of adjudication : The economics of judicial decision making in fin-de-siècle Ottoman Beirut and Damascus [en ligne]. Beyrouth : Presses de l’Ifpo, 2007 (généré le 26 avril 2019). Disponible sur Internet : <http://books.openedition.org/ifpo/575>. ISBN : 9782351592694. DOI : 10.4000/books.ifpo.575. Ghazzal, Zouhair. “Index”. The grammars of adjudication : The economics of judicial decision making in fin-de-siècle Ottoman Beirut and Damascus. By Ghazzal. Beyrouth : Presses de l’Ifpo, 2007. (pp. 725-745) Web. <http://books.openedition.org/ifpo/575>. GHAZZAL, Zouhair. 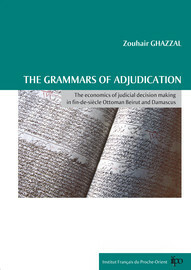 The grammars of adjudication : The economics of judicial decision making in fin-de-siècle Ottoman Beirut and Damascus. Nouvelle édition [en ligne]. Beyrouth : Presses de l’Ifpo, 2007 (généré le 26 avril 2019). Disponible sur Internet : <http://books.openedition.org/ifpo/461>. ISBN : 9782351592694. DOI : 10.4000/books.ifpo.461.